With a higher interest than ever in finding alternative fuel sources, it may come as no surprise that the trucking industry is now being closely looked at to develop resources that do not cause semis to rely solely on fossil fuels. being used per trip. What is also interesting to consider is that though large trucks only average about 6.5 miles per gallon, this is a steep increase since the 1970s when the average was only about 5.6 miles per gallon. Though a little less than an increase of a mile per gallon, with such big tanks, the average truck driving job is seeing a growing number of miles of road time per trip. Still, with an increasing consciousness of our carbon footprint, the industry is exploring different ways in which they can translate environmental-friendly practices into their fleets and trucks. There is still a long way to go, but firms have begun the process to both help increase fuel use and consider possible energy alternatives. One reason this trend may become more popular is due to the fact that more trucks are being sold. In fact, class eight trucks, the heaviest, exceeded their January 2016 sales by 20 percent – leading to a 14-month high. With more trucks being sold and therefore more trucks being on the road, it is becoming more important to consider alternatives to traditional fuel approaches. Ranges in these approaches vary massively with everything from different sized trailers and curbing emissions to more large scale alternatives such as electric or even fuel cell cabs. 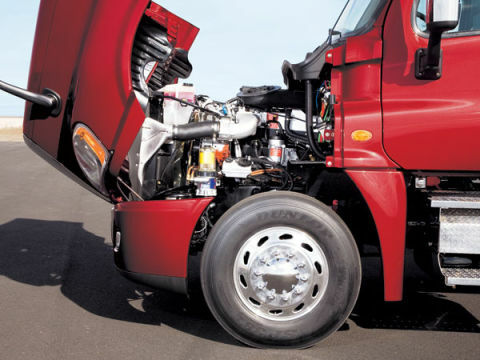 On the smaller side of changes, many fleets are encouraging more conscious fuel use. Though it may be tempting to completely fill your truck to increase drive time and decrease stops, overflow can become a huge problem. Where the smallest concern is the extra weight causing slow down of the trip, it can also cause dangerous leaks with the excess fuel leaching into the ground. Another result of these leaks would be that wasted fuel also means wasted money. While many with trucking jobs has recently heard the term “regulations” more and more, one of the easiest to comply with the existing regulations a personal regulation of speed. When one accelerates quickly, more fuel is used. Correct tire inflation can also lead to using less fuel. With proper inflation of tires, fueleconomy.gov reports that gas mileage can improve by up to three percent, with an average improvement of 0.6 percent. Not only does this help with fuel efficiency, but it also helps to increase the lifespan and safe performance of tires. Another great way to be mindful of fuel consumption is to take into account the amount of idling a truck may do. It has been shown that a truck consumes nearly an entire gallon of fuel for every hour it sits idling. Though there are obviously small changes drivers and transportation companies can make to their existing trucks and driving habits, many larger companies are considering full scale truck changes for the future. One that has made a lot of headway in recent years is a truck powered by Dimethyl Ether, or DME. DME, according to the Department of Energy, is an alternative fuel to diesel that must be used in specific compression ignition engines. The biggest benefit of this alternative fuel is that almost all particulate emissions are eliminated. Another great benefit of DME is that it can be produced from a number of sources aside from traditional fossil fuels, including organic waste and biomass. It also surpasses the cetane number of diesel fuel with 55 compared to diesel's 40-53. DME may seem like a promising alternative to diesel fuel, but it does run into many problems for full implementation. First and foremost, it is still highly flammable. A more concerning problem is the fact that due to its low energy density, it would require a twice as large fuel tank to handle. This, in turn, would require a lot of money to switch over existing trucks. Another monetary negation is that it requires a specially designed compression ignition engine that also needs a fuel system to specifically operate on DME. One manufacturer has begun testing on a 13-liter truck with results to be published later in 2017. Another form of alternative energy becoming well known within the trucking industry is the electric truck. Benefits of electricity as a fuel source are numerous according to the Department of Energy. However, the aspect of energy security has become a large issue surrounding electric vehicles. In order for diesel to become usable, it must be distilled, but it still relies on crude oil – much of which may comes from problematic areas within the world. With the reduction of need on these countries, there will be more crude oil in supply. Fuel economy also plays a big role in the benefits of electric trucks as it can increase the miles per gallon. The DOE does state that this is dependent on the weight of a load. Much of this fairly new interest came from Tesla, Inc. Elon Musk announced the need for electric vehicles to be be introduced on the fronts of heavy-duty trucks and also urban transportation vehicles such as city buses. 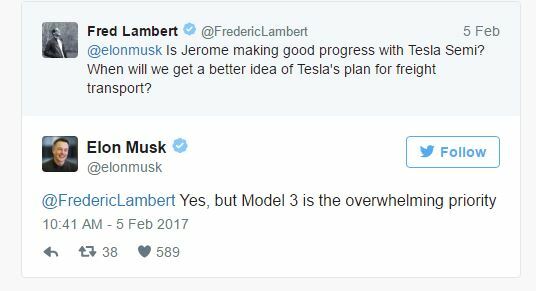 While still in the fairly early stages of development, Musk confirmed on Twitter that the Tesla semi is still a high priority within the company, but their more affordable passenger electric car is currently their main priority. When plans of the Tesla Semi were first released last July during part of Musk's self-proclaimed “Master Plan Part Deux”, there was a projected time frame of publicizing their concept within six to nine months – meaning sometime in the first half of this year. Their projected production of the electric semi would begin in three to four years. While electric vehicles obviously have their benefits, their current game plan and benefit ratio analysis is severely lacking with their only mention being that they “believe” it will reduce the cost of cargo transport. Another fuel alternative concept that has recently been gaining steam within the trucking community is that of hydrogen fuel cell powered semi. Often, hydrogen fuel cell and electric motor technologies are confused to the fact that both do rely on electric motors, but the two green operations work differently. In the simplest of terms, hydrogen fuel cell operated semis store fuel that then reacts to produce the necessary energy while electric semis have a specified amount of energy stored in their batteries. Nikola Motor Company has recently announced their Nikola One semi-truck which runs on hydrogen fuel cell technology. 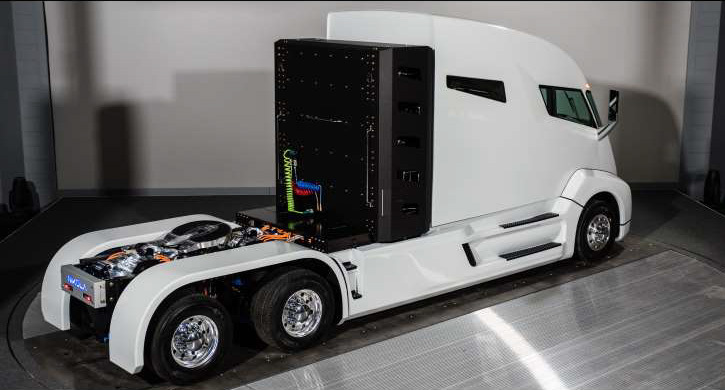 To power this large semi, a fuel cell power plant gives energy six electric motors found in-wheel. Just a few of the massive benefits the company lists of this semi include zero emissions and an 800-1,200 mile driving range. Many other benefits of the Nikola One also come from the company itself. The largest, by far, is the fact that the company is planning to give each leased truck one million miles of free hydrogen that will be available at their proposed 364 refueling stations. Another benefit the company is offering is connection with a large logistics system which will help to provide needed maintenance and other services for those with truck driver jobs. This may sound more than perfect with a negligible, if any, fuel cost, the semi truck is very expensive with lessees spending anywhere from $5,000 to $7,000 each month for the seven year leasing policy. Unlike the much promoted electric semi, there is a prototype already designed and a proposed date of 2020 for road touchdown. Though a handful of fleets and manufacturers are beginning to implement these technologies, or at very least are beginning to entertain them as ideas, much of this alternative fuel trucking trend is still left in the hands of large companies already vexed in the realm of these fields.Another large setback the industry must think about is the massive monetary investment it would take to convert their current system or invest in a complete overhaul of their trucks and fleets. One more factor of this trucking trend is that so much of this technology is still in development, much less being road ready. With impending governmental regulations on both commercial trucks and passenger vehicles, there is obviously a need for considering these technologies to implement them within truck driving jobs. Environmental advantages are increasingly being taken into consideration within the trucking community, but there are several steps and agreements that must be reached before alternative fuels can be wholeheartedly and mindfully considered as a possibility. Until then, steps and tips towards efficient fuel use should be taken into mind as a positive step towards cutting back emissions and increasing the use of every gallon of fuel. Compared to the status quo that was the 1970s, transportation companies have taken huge steps to get the most out of their mile, but careful consideration of constant improvements can be made to guarantee progress continues to be made for the future of driving jobs.